The Hinkley Kingsley 5 light designer chandelier in silver leaf finish features Regency grace and sophistication. Supplied by Elstead Lighting and designed by Hinkley. The Kingsley suite exudes an elegant glamour that cannot be ignored. 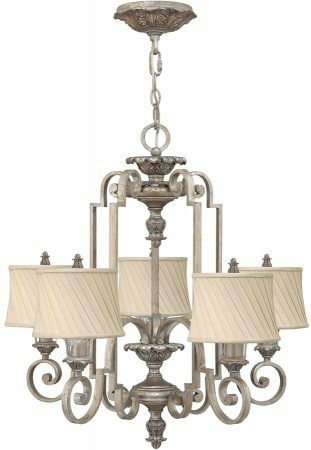 The hand-applied silver leaf finish harmonises with elegant glass bobesches, dark ivory pleated fabric shades and decorative cast finials for regal appeal. The Kingsley five-light chandelier is medium in size and captivating in style. It boasts a handsome strong symmetrical profile created by the five heavy cast scrolled braces that form the central body, suspended from a 178mm ceiling pan and chain finished in silver leaf. The ceiling mount is decorated with intricate leaf detail that is continued throughout the design on the finials, chandelier body and beneath each lamp holder. Five stepped scrolled lamp arms radiate from the centre, each fitted with a glass bobeche and dark ivory twisted pleat shade to add the finishing touch. This is a medium sized chandelier with a diameter of 66cm and a minimum ceiling height requirement of 78cm. Ideally suited to medium sized living rooms, dining rooms or bedrooms with sufficient ceiling height. Supplied with 305cm of chain that can be shortened at the time of installation, please see the technical information below for further information.